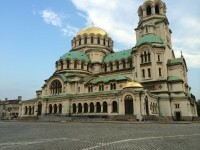 The last plenary meeting was hosted by ISOFT in the lovely city of Sofia (Bulgaria). The topics were mainly the last review meeting and what was still missing from a technical standpoint. For the last review of ADVENTURE, the two use cases are presented in context of ADVENTURE. AZEVEDOS INDUSTRIA is a producer of machinery used to manufacture cork stoppers, including design, custom built parts and control software as well as support and repair tasks. For the use case of AZEV, many manual tasks happen in a Virtual Factory, that can be based on default templates created once. Control2K (member of TANET) is a systems integrator providing monitoring solutions for companies like FORD. They extend their monitoring using ADVENTURE to integrate additional logic and smart sensors in their product and will demonstrate this using an ADVENTURE Virtual Factory.